Somehow I managed not to hear of Foods that Harm, Foods that Heal when it was first published to great success. Now, though, I'm getting the chance to see the fully revised and updated edition--and I'm glad I am. Subtitled "The Best and Worst Choices to Treat Your Ailments Naturally," this book begins with about 40 pages of information on nutrition and food safety. This includes topics like the good and bad aspects of carbohydrates (fats, proteins) and facts on widely publicized substances like high fructose corn syrup and BPA. The next section, which is about 180 pages, is alphabetical by food. For each food you'll find health benefits, health risks, serving tips, and storage tips. Not every food has every section--and some have "bonus" tips--but this is the general format. Following that is a section, about 130 pages, which is organized alphabetically by ailment. For each you'll find a brief description and a list of foods that help and foods that aggravate/trigger that condition. Nutrition tips and other helpful ideas are also included. The book ends with a short section called "Ages & Stages" (what we need at different ages) and a glossary. I like this book a lot. Although the Foods section was interesting to browse, I found the Ailments section more practical. Another thing that stood out: the indexing and cross-references are excellent. I plan to use this book to tweak my family's diet to help us feel better. What about you? Interested? 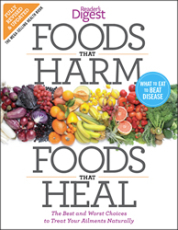 One lucky reader will win a copy of Foods that Harm, Foods that Heal. See the Terms and Conditions in the Rafflecopter widget for details. Disclosure: I received a copy of this book, at no cost to me, for review purposes. I was not required to write a positive review, and all opinions in this review are my own. I haven't had a book like this. I would like to eat more healthier, and this would be a good start. This is an interesting subject to me--would love to win. I'm very interested in learning about natural ways to improve health. This sounds like a very useful book. I've been paying more attention to things like this so anything that helps educate me will be welcome! I'm always trying to learn what foods are healthiest for my family & I. Would love to read this! Sounds like something I need to read. I like to treat myself with foods and vitamins rather than with medicines when I can. This books sounds right up my alley. Thanks. I would really like to read this to discover if my food choices are appropriate. :-) Thank you. i would love to win this book because i know that food is supposed to be our medicine! I have chronic migraines and recently I've been really changing my diet to see how it helps. This book seems simple to use and I love that it lists food by food. I think it would really help me right now make things simpler. I'd like to improve my eating style with the information I'd learn by reading this book. I would like this book because I would like to eat healthier. Thanks for the giveaway...would like to learn which foods have targeted health benefits !